One of our favorite family resource websites, Family Fun, has generously offered these special holiday recipes for us to share with you. Cooking with your children during the holiday season can help to create unforgettable memories together. We hope that you enjoy making these yummy recipes with your children. Line an 8-inch square pan with parchment or waxed paper, allowing the paper to hang over the sides. In a medium bowl, stir together the white chocolate chips, the condensed milk, and the salt. Melt the mixture according to the white chocolate package directions, then stir in the vanilla extract and 1 cup of the peppermint candies. Pour the fudge into the prepared pan and use a spatula to spread it evenly. Scatter on the remaining peppermint candy. Chill the fudge in the refrigerator until it's firm and set, about 2 hours. 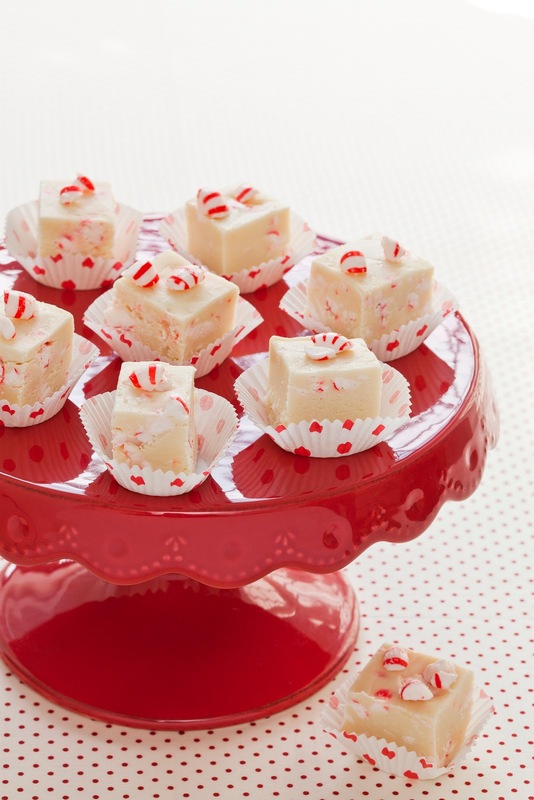 Use the overhanging flaps of paper to lift the fudge from the pan, then slice it into 1-inch squares. Heat the oven to 350 degrees and coat a baking sheet with cooking spray. In a medium bowl, whisk together the flour, baking powder, spices, and salt. In a stand mixer set on medium speed, beat together the butter and sugar until fluffy. Add the egg, molasses, and vanilla extract and mix until well incorporated. Reduce the mixer's speed to low and blend in the flour mixture. With slightly wet hands, halve the dough and shape each piece into a 2 1/2-by-9-inch rectangle. Transfer the loaves to the prepared baking sheet and bake them until they're golden brown and their tops are just starting to crack, about 25 minutes. Let the loaves cool on the sheet and reduce the oven's temperature to 325 degrees. Use a sharp knife to cut each loaf into 3/4 inch thick slices. Place the slices cut side down on the baking sheets and bake them until they're toasted, about 8 minutes. The pieces should be crunchy on the outside but not hard. Transfer them to a rack to cool completely. Melt the white chocolate chips in a heat-safe bowl according to the package directions, then spoon it into a ziplock bag and snip off a corner. 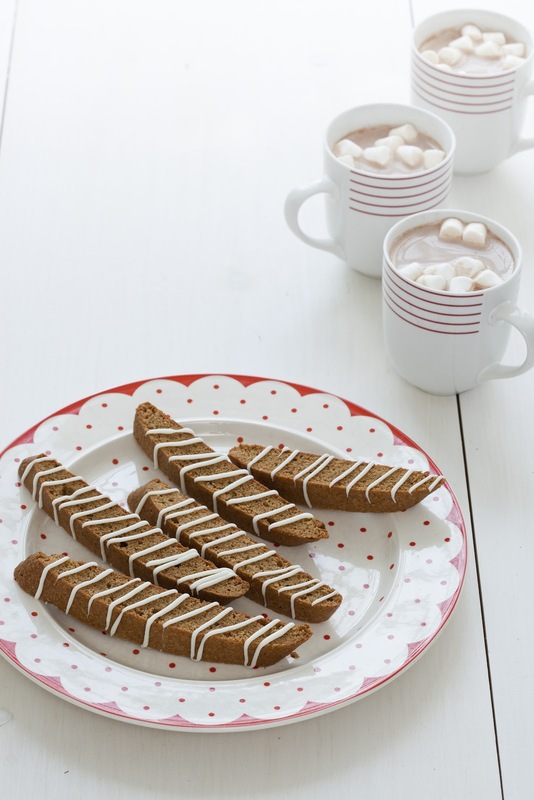 Drizzle the biscotti with the melted chocolate. Let the coating set before serving. 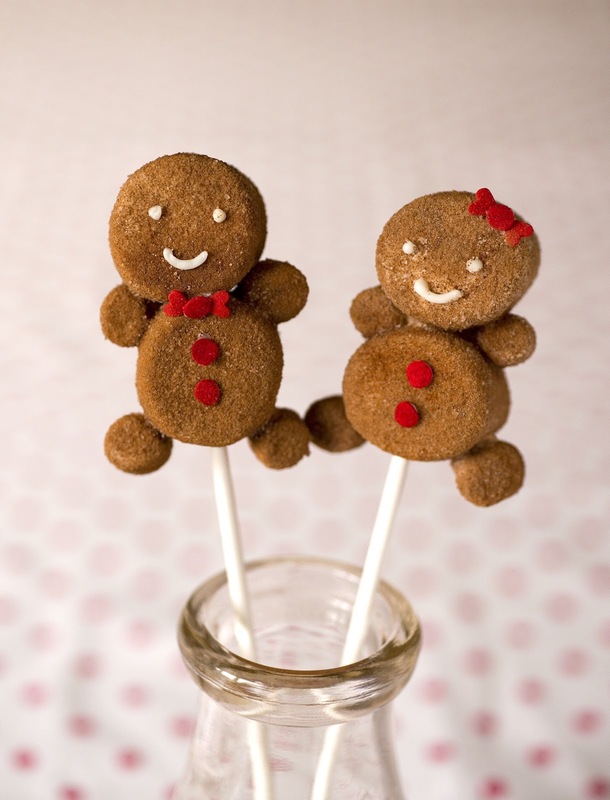 Combine 1/2 cup sugar with 2 teaspoons cinnamon and 1/2 teaspoons ginger in a medium bowl and set it aside. Fill another medium bowl with water. Melt 1 cup white chocolate chips according to the package directions, then transfer the chocolate to a ziplock bag and snip off a corner. To form each pop, slide two marshmallows onto a lollipop stick. Use the melted chocolate to adhere mini marshmallow arms and legs as shown. Let the chocolate set. Dip the pop in the water, then roll it in the sugar mixture until coated. Pipe on a chocolate face, then use more chocolate to attach heart and confetti sprinkle buttons, bows, and bow ties.